The Kai Skel iPad keyboard case comes with built-in 2800 mAh power bank to extend your iPad or smartphone battery life. Connect your device with charging cable (not included) to keyboard's USB port to charge device. The clamcase keyboard cover offers keypad typing experience with QWERTY key layout. Top row of buttons has 12 shortcut keys for quick access to iPad's native functions. - Insert iPad into case. Press on iPad edges to click into shell so it sits securely. 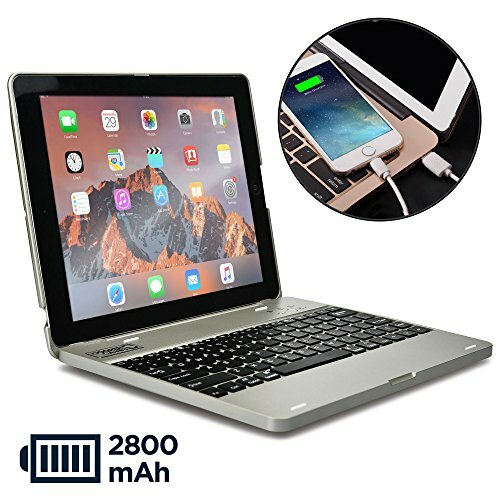 BEST SELLING BLUETOOTH KEYBOARD WITH BUILT-IN POWER BANK BATTERY - wireless Bluetooth iPad connection so you don't need cables. Keys provide typing experience just like on laptop. 12 shortcut hotkeys make it easy to search, switch language, change volume on iPad, etc. 2800 mAh battery gives 60+ usage hours of keyboard. Full battery recharge in 2 hours. Battery converts into powerbank to charge your iPad or iPhone when connected via built-in USB port. IDEAL FOR TYPING FOR BUSINESS, SCHOOL, TRAVEL OR HOME - designed to stand your iPad tablet hands free so you can focus on work, reading, typing like on normal computer. Great for men, women, students, boys, girls and kids / children in school. Weighs same as one Basketball - 620 g / 1.35 lbs. RISK-FREE PROMISE - If this case doesn't make typing on iPad faster, doesn't convert your iPad into a laptop, doesn't make you work & study faster, and doesn't extend battery life of your iPad or iPhone, then you are entitled for a full 100% refund - no questions asked! All stock shipped from USA. Next day delivery available with Express shipping excl. remote areas .